With the demands of life, sometimes your schedule does not permit for deep conditioning yet your hair is thirsting for more than a moisturizer. A curly just wants a quick rinse and go! Here are the daily conditioners for the curly girls who want to know the good…no, the great daily conditioners that are budget friendly, as many of us don’t want to break the bank. Yes, you can have fab curly hair with a daily conditioner without spending a ton of cash that you would rather spend on a mani pedi! Check out our top 20 daily conditioners below! Not only does the this conditioner smell divine, the ingredients include aloe vera gel, hemp oil, honey, and hydrolyzed silk protein. Do not be alarmed by the protein. The formula is gentle enough to use daily. A favorite among curlies, this conditioner gives intensive moisture while restoring and hydrating your thirsty curls. With shea butter, glycerin and aloe leaf juice, your strand will be left softer and more manageable than ever. If you want your hair to be supple and fragrant, U R Curly Quinoa Conditioner is a great choice! This conditioner has aloe to keep your hair moisturized and lavender extract that will keep your curls fragrant. If you are a wash and go curly with coarse strands, this conditioner is the way to go! Virgin coconut oil is high on the ingredients list to help lubricate and penetrate the hair shaft to moisturize your curls. Get rid of your flyaways and frizz hair with this argan and olive oil formulated thirst quencher. Gain shine, manageability, and softer hair all at a great price. Get deep conditioning for less with this seriously simple fix for dry hair. Regain your hair hydration, elasticity and beauty with a weekly or daily. Pumpkin seed oil is the star in this moisturizing conditioner that’s reasonable and works hard for your hair. The pumpkin seed oil will restore your hair's softness and retain moisture. Dove is known for combatting dryness and this conditioner is no exception. Working from the inside out, this conditioner has a micro moisture serum that nourishes and strengthens your hair. Weightless and moisture-driven, this is a great conditioner at a primo price. Get revitalized strands with this ultra-moisturizing botanical conditioner that will penetrate your hair from root to tip. Gain silkier hair that’s full of body without breaking the bank. Serum-infused formula with such impressive ingredients as orchid mascula flower extracts is probably the reason curlies rave about this conditioner. With rich ingredients that will soften your strands, you will be amazed at the mega slip and the small price. Like most of the Camille Rose Naturals products, this conditioner is chock-full of butters. The soy butter, olive butter, avocado butter, and olive oil in this conditioner will lubricate your strands while helping to seal in the moisture for highly porous strands. 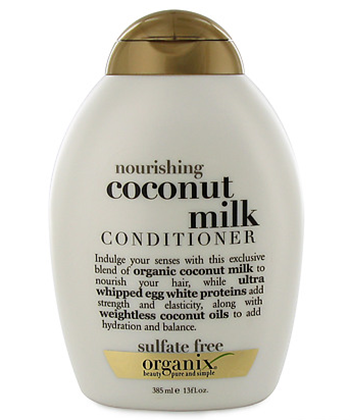 Get superior slip at a drugstore price from this coconut milk conditioner, which smells heavenly and will coat your strands in hydration. With organic coconut milk to add strength and elasticity, you will see a major and positive difference in your hair immediately. Get all the nourishment your hair needs without the parabens. Excessive dryness is a sign of damaged hair, so prevent it with this moisture balancing pro from Pantene. All about natural ingredients at a great price, the SheaMoisture African Black Soap Balancing Conditioner uses shea butter, coconut oil, mango seed butter, avocado oil, and African black soap extract to alleviate your hair and scalp ailments and irritations. Remove buildup, enhance shine, and gain volume while detoxifying your hair and scalp. Another powerful conditioner from SheaMoisture that’s packing a powerful punch with shea butter, argan oil, coconut oil, glycerin, and sea kelp extract to bring your hair back from the brink of dryness and damage city. Get your strand restored at a budget-friendly price. This conditioner is great for fine, thin hair that needs to be strengthened. Turn limp hair into full-bodied gorgeousness with baobab oil, vitamins A, C, D, E and F, while the yucca thickens your strands and gives you more volume than you could imagine. Known for giving you more for your money, Suave has made many a natural happy with this almond and shea butter conditioner. This moisturizing conditioner will replenish and leave your hair nourished and gorgeous. Infused with coconut oil and vitamin E, this tropical coconut conditioner will restore moisture to your dry, brittle hair while filling the air with a lush coconut scent. Rosemary oil, organic Valencia orange citrus, mango, lemongrass, ginko biloba, enhinacea, willow bark, and other amazing ingredients make this ultra-nourishing and super cheap conditioner a hit among curlies. Dry hair is replenished and given all the moisture it needs to stay healthy. Get optimal curl hydration, softness, and a frizz reduction from this hard-working moisturizing conditioner. Feel softer strands and see the movement all for a super perfect price.